“The light at the end of the tunnel” was seized by Ashford as an epithet before Channel Tunnel Construction was underway. 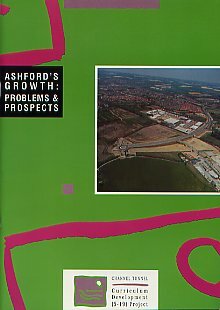 Ashford has stood as a declining railway and market town and the Borough Council was looking for better times. Designated as a growth area in the Kent Structure Plan to relieve pressure elsewhere in the county and having a prime location for commercial and industrial developments looking in the direction of continental Europe. Ashford was clearly on the threshold of significant change. A group of geography teachers in Kent, with the support of the Chanel Tunnel Curriculum (5-19) Project, produced this sequence of learning activities for A’ Level students investigating the challenge of urbanisation. After observing the background of the town’s growth and current images of the area, the focus is on the issues associated with the recent large-scale developments proposed for the south-east sector of Ashford. Amongst other factors it relates growth in Ashford to transport infrastructure changes in Kent including the Channel Tunnel. These developments are set in the context of the planning system which operates at national, regional and local levels. Students evaluate the possible effects of different development proposals on the social, economic and natural environments. Twenty years later, what has happened?